Only a month into the new year, and my husband and I already need to reevaluate our one income budget! Isn’t that how life is, though? I have found that especially when it comes to money best laid plans often go awry. I know I don’t blog a lot about personal finance, but I thought it would be fun to list some budget busters. Budget busters are those pesky things that cause you to leak money without you really realizing it. The amount may seem small at first, but when you take into account how much those little charges add up, the amount can be significant. This one is a big budget buster. You may be paying $100+ a month to have this service. Really evaluate how much TV you watch. Do you need to spend that much money on TV? You can save a lot of money by using a service like Netflix or Hulu. Redbox rentals are fairly cheap, too. For shows that you want to watch in real time, you can often get a subscription for $5 a month and watch them on the internet. I’ve been guilty of getting too much take-out during tough seasons. Sometimes it’s hard to avoid it, but I suggest meal planning as much as you can. You can even try once-a-month grocery shopping to save you even more time and money. It’s also important to have a master list of meals that you know your family enjoys and you can easily prepare them. Thankfully I’m not much of a shopper, but if you enjoy shopping for fun, this may be one area you need to cut out until you get your budget under control. I saw a meme on Facebook the other day that showed a woman going on a few shopping trips. When she went to the grocery store, she got the cheapest things, but when she got to the bookstore, she blew all of her money. Stay away from things you know are your weaknesses. You can borrow books from the library for free and you can build your child’s library frugally. You can buy your kids’ clothes on consignment. When making major purchases, do your research and try to get the best deal! When my husband and I were dating, we blew a lot of money on entertainment. Every weekend we went to the movie theater or did something fun. Entertainment is a great thing, and I encourage you to spend your hard earned money wisely. Take advantage of discounts. If you’re a member of the military, always check to see if you can get a military discount! For our family, it is cheaper to purchase a membership to our local zoo and go several times a year than it is to make two trips. Don’t forget the power of free entertainment! My kids love a picnic at the park and it only costs us a little bit in groceries to pack up some sandwiches and drinks. Many communities offer free events throughout the year, and libraries do, too! My husband likes Starbucks, but Starbucks is expensive. We can’t afford one $5 coffee five days a week. We invested in a Keurig and some nice insulated cups and make our own coffee at home. Now coffee out is a special treat instead of a huge expense! 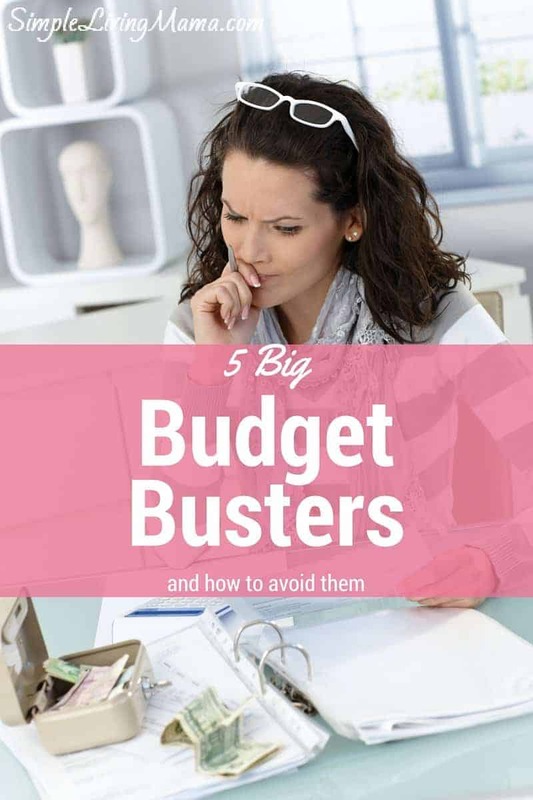 These are just 5 budget busters you can take out of your life while you get control of your budget! Do you have anything to add to the list? Leave me a comment below! I KNEW you were coming after my Starbuck’s! But only because I know it’s true 🙁 Great reminders! Yup! Gotta go after the Starbucks! These are great tips! Fortunately, I’m finding they are easier to follow with two kids now. haha I don’t always want to take quick little trips to the store with two of them. I do end up going to the grocery store twice a week though. I need to mean plan better. Yup. I do not like going to the store since I’ve had kids! Lol! We always overspend on food – take-out we do occasionally, but food shopping is insane!! Definitely need to find some solutions there! Food is expensive! Plus, those darned kids just keep growing and eating more lol. Once-a-Month grocery shopping has helped us with our budget! You should check out my book! These tips are spot on…. I just wish I could give up my Starbucks… hopefully one day. I know, it’s hard to give up the Starbucks! Great tips! My husband and I have never had cable simply because it is WAY overpriced! And cooking at home definitely helps too, I make coffee with our french press and save a ton of money! Our family got rid of satellite tv several years ago. It just wasn’t worth the cost. Kali recently posted…Are You Living a Life of Love? I finally gave up my latte-a-day habit courtesy of the flu. This is a many decade habit and a severe flu and determination let me kick it to the curb. Yay finally!